The complete range of SPX Flow Power Team hydraulic pump accessories, including extra large reservoirs, controllers, subplates, wheel kits and carts, and more. If you have any questions regarding an order talk to our in house hydraulics experts today. 203225 Remote hand control. Heavy-duty with single push button switch in a neoprene housing with 3.1 m cord. Housing seals out dust, lint and liquids (unit is not submersible). 10461 Remote foot control with 3.1m cord. 202777 Remote hand control. Has rocker style switch that is momentary advance, spring centre hold and detented retract. It comes with a 3.1m cord for use with 3-way/2 or 3-position valves. 202778 Remote hand control. Has rocker style switch that is momentary advance, spring centre hold and momentary retract. It comes with a 3.1m cord for use with 4-way/3-position valves. 309653 Remote foot control. Can be used in place of either of the above hand controls to control the same type of valves. The switch is momentary on both the advance and retract position and is spring centred to the hold position. This foot switch comes with a 3.1m cord. 17627 Remote foot control. Same as the No. 309653 but without a cord. 304718 Remote hand control. Has a rocker style switch that is momentary advance, spring centre hold and momentary retract. The switch is wired to start and stop the motor when the valve is energized. It comes with a 3.1m cord. To be used with 4-way/2-position valves. 309652 Remote foot control. Has same functions as No. 304718. Supplied with a 3.1m cord. To be used with 4-way/2-position valves. 216209 Remote foot control. Same as the No. 309652, but without a cord. 209593 This remote air motor hand control has two momentary push buttons, one for advance and one for retract with spring offset to hold. To be used with 4-way/2-position air pilot valves. 3.7m cord. 9510 Subplate for remote mounting the following valves; 9500, 9501, 9502, 9504, 9506, 9507, 9511, 9552, 9572, 9575, 9576, 9592, 9594 and 9609. 9620 For use with 9500, 9501, 9502, 9552, 9572, 9592 and 9594. Same as No. 9510 but has integral pressure regulating valve. 9515 Pump mounted subplate for use with the following valves: 9500, 9501, 9502, 9504, 9506, 9507, 9511, 9552, 9572, 9575, 9576, 9592, 9594 and 9609. 9521 Subplate for use under most pump mounted valves to provide adjustable pressure control on units not equipped with an external pressure regulator. 9531 Air Filter / Regulator / Lubricator. Recommended for use with single-speed air/hydraulic pumps. Filter/regulator. 1/4" NPTF inlet and outlet. 9625 Pressure switch. Used in a hydraulic circuit where system pressure must be "held". Attaches directly to control valve manifold or can be mounted "in-line" to read system pressure. Has a 1/4" NPTF male thread, and a 1/4" NPTF fitting for gauge mounting if required. Adjustable from 70 to 700 bar. Can also be used to actuate other electrical devices in the system. Wired “normally open” and held closed by spring pressure. 9641 For use when an air pilot signal is required at a set hydraulic pressure. Attaches directly to control manifold or can be mounted in-line to read system hydraulic pressure. Automatically turns on an air pilot signal when a predetermined system pressure is reached. Has 1/4 NPTF male thread and 1/4 NPTF fitting for gauge mounting if required. Adjustable from 35-700 bar. Maximum rating of 25 scfm at 100 psi. 9643 Pilot operated control valve, normally open, with 1/4" NPTF male thread. 206767 Reservoir breather kit designed for use on PA17, PA55, PE17, PE55, PE84, PE90, PE120, PG55, PG120, PQ60 and PQ120 series pumps. These kits replace the reservoir filler cap when the pump is used in dusty and dirty environments. 10494 Single wheel caster. 50.8 mm diameter casters attach to the bottom of large reservoir for portability. 350431 Displays fluid level and temperature of hydraulic oil in reservoir. 0° to 100°C. 32 mm wide and 162 mm high. 16339 Guard for use with 10461 and 251660 foot controls. 207762 Magnetic strip with adhesive back can be added to No. 25017, 202777, 202778 and 304718 hand controls. Provides 2.7 kg. of holding force. 300507 Seal kit for P12 hydraulic hand pump. 300472 Seal kit for P23 & P55 hydraulic hand pump. 300510 Seal kit for P59 hydraulic hand pump. 300508 Seal kit for P157, P159 & P300A hydraulic hand pump. 300690 Seal kit for P157 and P159B hydraulic hand pump. 300696 Seal kit for P300B hydraulic hand pump. 300509 Seal kit for P157D, P159D & P300D A hydraulic hand pump. 300693 Seal kit for P157D & P159D B hydraulic hand pump. 300699 Seal kit for P300DB hydraulic hand pump. PC200 Universal pump cart with 305 mm wheels. Capable of handling pumps weighting up to 90kg. Cart can be used with the following pumps: PA60, PA64 and PA554 air/hydraulic pumps; PE55 series, PE183-2 and PE184-2 electric/hydraulic pumps; PE21, PQ60 and PQ120 series "Quiet" pumps; PG55 series petrol engine/hydraulic pumps; and pumps with optional 19 and 38 l reservoirs; Nos. RP50, RP51, RP101 and RP103. PC200RC Roll cage for use with PC200 (Cannot be used on pumps with 38 litre reservoirs). RC5 Roll cage for use with PG120 and PG55 series pumps. 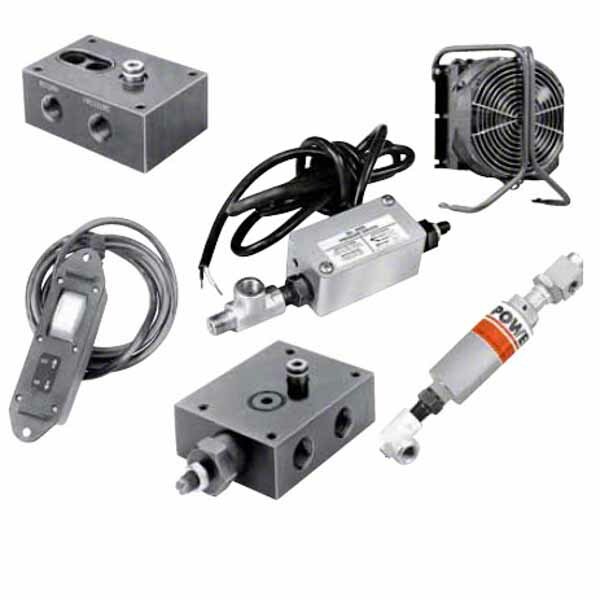 213896 1.7 l metal reservoir conversion kit for pumps PA6, PA6A, PA6D, PA50, PA50R, PA6R. 213895 9.5 l metal reservoir conversion kit for pumps PA6-2, PA6D2,PA50R2, PA172, PA174, PE172, PE172A, PE172S, PE174. Here at SGS, we stock the complete range of SPX Flow Power Team hydraulic pump accessories to use with your hydraulic equipment. Whether you’re looking for hydraulic pump control, reservoirs or seals, we have a large collection of accessories for you to choose from, all of which have been manufactured by leading brand in the industry, SPX Power Team. You can find all the accessories you might need on our online shop – explore our range of hydraulic pump parts which include extra-large reservoirs, controllers, hydraulic pump subplates, wheel kits and carts, and more. For example, if you’re looking for hydraulic pump seal kits, we have a number of options to suit your hand pump specification. We also have a number of hydraulic pump control systems with mechanisms that can be operated by hand or foot. With years of experience in precision engineering, we have put our expertise to good use here at SGS – by providing our customers with an extensive collection of quality, long lasting products that can be used with a huge range of hydraulic equipment. When you choose to buy with us, we offer an extended two-year warranty on our products, as well as a 60-day returns policy to give you added peace of mind. If you have any questions regarding our range of air hydraulic pump parts, you can talk to our in-house hydraulics experts today by calling 01332 576 850 or contact us here.